Are you ready to learn about Airway Clearance Therapy? I sure hope so because that is what this study guide is all about. As a Respiratory Therapist, this is definitely a topic that you must know — especially as a student. The good news is — the practice questions in this study guide can give you a good understanding of everything you need to know. Actually, this information correlates well with Egan’s Chapter 43, so you can use it to help prepare for your exams. So if you’re ready, let’s dive in. Before we begin, does your school use the Egan’s Workbook as mine does? If I had to guess, I’d say so since most RT programs use it. Don’t get me wrong, it’s a solid workbook that can be helpful at times. The problem is, it takes way too long to look up all the answers. 1. What is the primary goal of airway clearance therapy? To help mobilize and remove retained secretions with the ultimate aim to improve gas exchange, promote alveolar expansion, and reduce work of breathing. 2. Review the following: Copious secretions, acute respiratory failure with retained secretions, acute lobar atelectasis, V/Q abnormalities caused by unilateral lung disease. These are all indications for what? 3. Before airway clearance therapy is started, what is something that may be administered to help improve the overall effectiveness of treatment? 4. Why is coughing or suctioning pertinent in airway clearance therapy? Because the therapies applied only help to move secretions into the central airways — they still need to be removed and you do that by coughing or suctioning. 5. In theory, how does positive expiratory pressure (PEP) help to move secretions into the larger airways? Filling under-aerated segments through collateral ventilation, and Preventing airway collapse during expiration. Exhale forcefully and maintain an expiratory pressure of 10 to 20 cm H2O. 7. A physician orders bronchodilator drug therapy in combination with positive expiratory pressure (PEP). Which of the following methods could you use to provide this combined therapy? Attach a metered-dose inhaler to the system’s one-way valve inlet, and Place a small-volume nebulizer in-line with the PEP apparatus. 8. What is the movement of small volumes of air back and forth in the respiratory tract at high frequencies (12 to 25 Hz) called? 9. Which of the following parts are required to conduct high-frequency external chest wall compression? Variable air-pulse generator, and a Non-stretch inflatable thoracic vest. 11. Which of the following determines effectiveness of high-frequency external chest wall compression therapy? Compression frequency and Flow bias. 12. The airway clearance technique that uses a pneumatic device to deliver compressed gas mini-bursts to the airway at rates above 100/min best describes what? 13. Which of the following is true about exercise and airway clearance? Exercise can enhance mucus clearance, Exercise can improve pulmonary function, Exercise can improve V/Q matching, and Exercise can cause desaturation in some patients. 14. Patients can control a flutter valve’s pressure by changing what? 16. Which of the following is not an advantage of the Acapella over the flutter? 17. Which of the following should be considered when selecting a bronchial hygiene strategy? Patient’s goals, motivation, and preferences; Effectiveness and limitations of technique or method; Patient’s age, ability to learn, and tendency to fatigue; and Need for assistants, equipment, and cost. 18. Which of the following airway clearance techniques would you recommend for a 15-month-old infant with cystic fibrosis? Postural drainage, percussion, and vibration. 19. Which of the following airway clearance techniques would you recommend for a patient with a neurologic abnormality (bulbar palsy) and intact upper airway? Postural drainage, percussion, and vibration; and Mechanical insufflation-exsufflation. 20. In assessing an adult outpatient for bronchial hygiene therapy, has (1) no history of cystic fibrosis or bronchiectasis, (2) sputum production of 30 to 50 ml/day, (3) an effective cough, and (4) good hydration. Which of the following would you recommend? 21. Strenuous expiratory efforts in some chronic obstructive pulmonary disease (COPD) patients limit the effectiveness of coughing. Why is this so? High expiratory pleural pressures compress the small airways. 22. Under which of the following conditions would mechanical insufflation-exsufflation with an oronasal mask probably NOT be effective? If the glottis collapses during exsufflation, or the presence of a fixed airway obstruction. 23. Whether using traditional methods or the FET, a period of diaphragmatic breathing and relaxation should always follow attempts at coughing. What is the purpose of this approach? To restore lung volume and minimize fatigue. Reverse the underlying disease process. 25. Soon after you initiate postural drainage in a Trendelenburg position, the patient develops a vigorous and productive cough. Which of the following actions would be appropriate at this time? Move the patient to the sitting position until the cough subsides. 27. A typical mechanical insufflation-exsufflation treatment session should continue until what point? Secretions are cleared; The vital capacity (VC) returns to baseline; and The SpO2 returns to baseline. 28. What are the best documented preventive uses of bronchial hygiene therapy? Prevent retained secretions in the acutely ill; and Maintain lung function in cystic fibrosis. 30. Which of the following acutely ill patients is LEAST likely to benefit from the application of chest physical therapy? Patient with an acute exacerbation of chronic obstructive pulmonary disease (COPD). 31. A physician orders postural drainage for a patient with aspiration pneumonia in the anterior segments of the upper lobes. Which of the following positions would you recommend for this patient? Patient supine with a pillow under knees, bed flat. 32. During chest physical therapy, a patient has an episode of hemoptysis. Which of the following actions would be appropriate at this time? Stop therapy, sit the patient up, give O2, and contact the physician. 33. A chronic obstructive pulmonary disease patient cannot develop an effective cough. Which of the following would you recommend to help this patient generate a more effective cough? Enhancing expiratory flow by bending forward at the waist, Using short, expiratory bursts or the “huffing” method, and Using only moderate (as opposed to full) inspiration. 34. Which of the following is NOT a hazard or complication of postural drainage therapy? 35. Which of the following is the only absolute contraindication to turning? When the patient has unstable spinal cord injuries. 36. A physician orders postural drainage for a patient with aspiration pneumonia in the superior segments of the left lower lobe. Which of the following positions would you recommend for this patient? Patient prone with a pillow under abdomen, bed flat. 37. In which of the following patients would you consider modifying any head-down positions used for postural drainage? A patient with unstable blood pressure, A patient with a cerebrovascular disorder, A patient with systemic hypertension, and A patient with orthopnea. 38. Which of the following is false about the FET? It occurs from mid to high lung volume without glottis closure. The number of prior surgical procedures. 40. Which of the following measures would you use to ask patients for the presence of copious mucus production? 41. Which of the following occurs during the compression phase of a cough? 42. A patient recovering from abdominal surgery is having difficulty developing an effective cough. Which of the following actions would you recommend to aid this patient in generating a more effective cough? Coordinating coughing with pain medication, Using the forced expiration technique (FET), and “Splinting” the operative site. 45. Percussion should NOT be performed over which of the following areas? Surgery sites, Bony prominences, and Fractured ribs. 47. A patient about to receive postural drainage and percussion is attached to an (ECG) monitor and is receiving both intravenous (IV) solutions and O2 (through a nasal cannula). Which of the following actions would be appropriate for this patient? Inspect and adjust the equipment to ensure function during therapy. 48. Properly performed chest vibration is applied at what point? 49. In general, chest physical therapy can be expected to improve airway clearance when a patient’s sputum production exceeds what volume? 50. Which of the following conditions are associated with chronic production of large volumes of sputum? Bronchiectasis, Cystic fibrosis, and Chronic bronchitis. 51. Which of the following are mandatory components of the pre-assessment for postural drainage? 52. Which of the following should be charted after completing a postural drainage treatment? Amount and consistency of sputum produced, Patient tolerance of procedure, Position(s) used (including time), and Any untoward effects observed. 53. Maintaining an open glottis during coughing (as with the FET) can help to minimize increases in pleural pressure and lessen the likelihood of bronchiolar collapse. Which of the following techniques can aid the teaching the patient this maneuver? Having the patient phonate or “huff” during expiration. 54. Key considerations in initial and ongoing patient assessment for chest physical therapy include which of the following? Posture and muscle tone, Breathing pattern and ability to cough, Sputum production, and Cardiovascular stability. 55. While reviewing the chart of a patient receiving postural drainage therapy, you notice that the patient tends to undergo mild desaturation during therapy (a drop in SpO2 from 93% to 89% to 90%). Which would you recommend to manage this problem? Increase the patient’s FIO2 during therapy. 56. Conditions that can affect airway patency and cause abnormal clearance of secretions include which of the following? Foreign bodies, Tumors, Inflammation, and Bronchospasm. 57. Which of the following is/are necessary for normal airway clearance? Patent airway, Functional mucociliary escalator, and Effective cough. 58. The application of gravity to achieve specific clinical objectives in respiratory care best describes which of the following? 59. For which of the following patients directed coughing might be contraindicated? Patient with poor coronary artery perfusion, and Patient with an acute unstable spinal injury. 61. Which of the following is/are TRUE of postural drainage? It is most effective in disorders causing excessive sputum, It is most effective in head-down positions greater than 25 degrees, and It requires adequate systemic hydration to be effective. 62. A key consideration in teaching a patient to develop an effective cough regimen includes which of the following? Strengthening of the expiratory muscles, Instruction in breathing control, and Instruction in proper positioning. 65. What type of patients do you recommend EzPAP for? To patients with a decreased FRC. 66. Which of the following are potential indications for positive airway pressure therapies? Reduce air-trapping in asthma or chronic obstructive pulmonary disease, Help mobilize retained secretions, Prevent or reverse atelectasis, and Optimize bronchodilator delivery. Air-trapping/pulmonary overdistention in chronic obstructive pulmonary disease. Improvement of the ABG values. 69. Hazards of positive airway pressure therapies associated with the apparatus used include which of the following? Increased work of breathing, Claustrophobia, Increased ICP, Vomiting and aspiration, and Skin breakdown and discomfort. 70. A physician orders positive expiratory pressure therapy for a 14-year-old child with cystic fibrosis. Which of the following should be monitored? Sputum production, Breath sounds, Pulse rate, and Breathing pattern. 71. Which of the following best describes positive expiratory pressure (PEP) therapy? Expiration against a variable flow resistance. 72. What is the most important protective reflex? 73. What are the 4 distinct phases to a normal cough? Irritation, inspiration, compression, and expulsion. 74. What disease state is the airway permanently damaged, dilated, and prone to constant obstruction by retained secretions? 75. What are the most common conditions that affect the cough reflex? 76. What are the five general approaches to airway clearance therapy? (1) CPT, (2) coughing, (3) PAP, (4) High Frequency Compression/Oscillation Methods, and (5) Mobilization and physical activity. 77. What does CPT consist of? Percussion, postural drainage, and vibration. 78. What type of therapy involves the use of gravity and mechanical energy to help mobilize secretions? 79. What should be used during postural drainage if hypoxemia is suspected? 80. How long should you administer postural drainage? 81. What should you do between positions? Pause for relaxation and breathing control to prevent hypoxemia. 82. When a patient is in the head down position, what should the patient avoid? Strenuous coughing to avoid an increased ICP. 83. Will there be an immediate production of secretions in doing postural drainage therapy? 84. What type of breath sounds would you hear once postural drainage therapy has been administered? Breath sounds may worsen. You may hear coarse crackles after treatment. 85. What is involved in application of mechanical energy to the chest wall by the use of either hands or various electrical or pneumatic devices? CPT, i.e. percussion and vibration. 86. How should hands be positioned when percussing? 87. What type of cough is a deliberate maneuver that is taught, supervised, and monitored? 88. What type of patients may not be able to do the direct cough regimen? Those that are obtunded, paralyzed, uncooperative patients, patients with COPD and neurologic, muscular and skeletal abnormalities. Also dehydration, thick secretions, artificial airways and depressants can thwart direct cough techniques. 89. In patients with muscle weakness, such as COPD patients and patient with neuromuscular disease, what must be done to help remove their secretions? Either suctioning or mechanical insufflation-exsufflation. 90. What is the term used for when a clinician can use his or her hands to support the area of incision during the expiratory phase of a cough? 91. What type of breathing method is useful for COPD patients that can’t get an effective cough? Use pursed lip breathing while leaning forward. 92. What are the 3 categories of chest percussors? Manual, pneumatic, and electrically powered devices. 93. Impaired airway clearance and retention of secretions can be a result of what? Any abnormality that alters airway patency such as mucociliary function, strength of the inspiratory or expiratory muscles, thickness of secretions, or effectiveness of the cough reflex. 94. What are the results of mucus plugging? It can result in atelectasis, impaired oxygenation secondary to shunting, WOB, air trapping, overdistention, and ventilation/perfusion imbalance. 95. What disease has the solute concentration of the mucus is altered because of abnormal sodium and chloride transport? It increases the viscosity of mucus and impairs its movement up the respiratory tract. 96. What is the condition called where the respiratory tract cilia do not function properly? 97. What is the disease where the airway is permanently damaged, dilated and prone to constant obstruction by retained secretions? 98. What are the clinical signs of patients with retained secretions? Audible abnormal breath sounds, deteriorating arterial blood gases, chest x-ray changes. 99. How much sputum production must be produced in order for therapy to be initiated? 25-30 ml per day for airway clearance therapy. 100. What therapy uses gravity and mechanical energy to help mobilize secretions? 101. How often should postural drainage techniques be performed on critically ill patients and patients on mechanical ventilation? Every 4-6 hours. The frequency should be determined by assessing the patient’s response to therapy. 102. To avoid gastroesophageal reflux and the possibility of aspiration, how long should you wait before treatment after a meal? 1.5 to 2 hours before or after feedings. 103. What should you do as a therapist if you know the patient will be in pain during postural drainage therapy? Correlate their therapy sessions with scheduled pain medications. 104. Why should a patient avoid coughing when using the head down position during therapy? 105. What kind of breath sounds may you hear after therapy? Coarse crackles. Their breath sounds may get worse due to the secretions moving into the larger airways. 106. What are potential problems with mechanical vibration devices? Noise, excess force, electrical shock, and mechanical failure. 107. What are the six adjunctive breathing techniques? Directed cough (controlled cough), Diaphragmatic breathing, Unilateral chest expansion, Acute chest expansion, Pursed-lipped breathing, and Forced expiratory technique (FET). 108. In what area of the lungs is cough most effective? In the central area, not the peripheral. 109. What are the 3 most important aspects involved in patient teaching with directed cough? (1) Instruction in proper positioning, (2) instruction in breathing control, and (3) exercises to strengthen the expiratory muscles. 110. In patients with neuromuscular conditions, what 3 options are there to help them get rid of retained secretions since cough is hard for them to obtain? (1) The placement of an artificial airway, (2) manually assisted cough, and (3) manual insufflation-exsufflation. 111. What consists of one or two forced expirations of middle to low lung volume without closure of the glottis, followed by a period of diaphragmatic breathing and relaxation? Huff cough or forced expiratory technique. 112. What maneuver may a patient do to help clear secretions with less change in pleural pressure and less likelihood of bronchiolar collapse? 113. What technique uses the diaphragmatic breathing to mobilize secretions by varying lung volumes and expiratory airflow in 3 distinct phases? 114. What is known as the artificial cough machine, cough assist device, or coughlator? 115. What term refers to the rapid vibratory movement of small volumes of air back and forth in the respiratory tract? 116. What are the 2 general approaches to oscillation? External chest wall application and airway application. 117. What is external application of oscillation referred as? High-frequency chest wall compression (HFCWC). 118. What does airway application of oscillation methods include? The flutter valve and intrapulmonary percussive ventilation. 119. What device uses a two part system with a variable air pulse generator and a non-stretch inflatable vest that covers the patient’s entire torso? 120. What are the hertz ranges for high frequency chest wall oscillators? 121. How long do you typically perform HFCWO? 122. What device is an airway clearance device that uses a pneumatic device to deliver a series pressurized gas mini-bursts at rates of 100 to 225 cycles per minute to the respiratory tract, usually via a mouthpiece? 123. What is a popular approach to PEP therapy? 124. What kind of devices are believed to work based on the principle of collateral ventilation, which suggests that airflow can occur between adjacent lung segments thru the canals of Lambert and thru the pores of Kohn? Airway oscillating devices that produce PEP with oscillations in the airway during expiration. 125. What airway clearance device can decrease viscoelasticity of mucus within the airways modifying mucus and allowing it to be cleared more easily by cough? 126. What advantage does the Acapella have over the flutter valve? 127. What are the appropriate airway clearance techniques that may be used for CF, ciliary dyskinesia syndrome, bronchiectasis? 128. What is the recommended airway clearance technique for a patient with atelectasis? 129. What is the recommended airway clearance technique for a patient with asthma with mucus plugging? Exercise, PEP, PDPV, Flutter valve, and HFO. 130. What is the recommended airway clearance technique used for a patient with neurologic abnormalities? 131. What is the recommended airway clearance technique used for a patient with musculoskeletal weakness such as muscular dystrophy, myasthenia gravis, and poliomyelitis? 132. What is the Acapella? It has a customizable frequency and flow resistance. It can be used in any posture and is NOT as portable as the flutter valve. 133. Adding exercise to mobilization and coughing can do what? It can enhance mucus clearance, improve V/Q matching, improve pulmonary function, and result in oxygen desaturation. 134. Aerosol drug therapy may be added to a PEP session by means of what? A handheld nebulizer or an MDI (attached to one-way valve inlet of the system). 135. Before starting postural drainage what assessments should be completed? Patients vital signs and chest auscultation. 136. What are the bronchial hygiene methods? Postural drainage therapy (including percussion and vibration), Positive airway pressure (PAP), and Oscillation. 137. Bronchial hygiene would not be beneficial to patients with what condition? 138. Chronic conditions that may cause copious secretions and indicate the need for bronchial hygiene include? Cystic Fibrosis, Bronchiectasis, and Chronic bronchitis. 139. What is the clinical procedure for PAP therapy? Instruct the patient to: Take in a breath that is larger than normal, but do not completely fill lungs, Exhale actively, but NOT forcefully, Perform 10 – 20 breaths, Repeat the cycle four to eight times but do not exceed 20 minutes. 140. The clinical signs that there is a problem with retained secretions are? Loose, ineffective cough, Labored breathing pattern, Course inspiratory and expiratory crackles, and Fever. 141. What are the contraindications for a directed cough? Patients with pathogens transmitted by droplets (TB), Presence of an elevated ICP, Poor coronary artery perfusion, and a spinal cord injury. 142. What are the contraindications for PAP adjuncts to bronchial hygiene therapy? An ICP greater than 20 mmHg, Untreated pneumothorax, Recent facial, oral, skull surgery or trauma. 143. A directed cough is useful in helping maintain bronchial hygiene in patients with what? Patients with CF, Patients with bronchiectasis, and Patients with a spinal cord injury. 144. The documentation of postural drainage therapy should include what? The position(s) used, Time in each position, Patient tolerance, Amount and consistency of sputum produced, and Any untoward effects observed. 145. The factors that may hinder an effective cough include? Severe restrictive disorders (COPD), Fear of pain, Systemic dehydration, Thick, tenacious secretions, Artificial airways, and the use of CNS depressants. 146. What are the factors that provoke a cough? Infection, foreign bodies, and irritating gases. 147. If a patient experiences hemoptysis during postural drainage therapy, what action should be taken? Stop the therapy, return the patient to their previous resting position, administer or increase their FIO2, and contact the physician. 148. If the procedure causes a vigorous cough, you should have the patient should do what? Get into a sitting position until the cough subsides. 149. The indications for PAP adjuncts to bronchial hygiene therapy include what? To reduce air trapping, To aid in mobilization of retained secretions, To prevent or reverse atelectasis, and To optimize delivery of bronchodilators in patients receiving bronchial hygiene therapy. 150. What is Intra-pulmonary Percussive Ventilation (IPV)? An airway clearance technique that uses a pneumatic device to deliver a series of pressurized gas mini-bursts at rates of 100 to 225 cycles per minute. 151. Key considerations in assessing a patient for CPT include what? Posture, muscle tone, Effectiveness of cough, Sputum production, Breathing pattern, and Cardiovascular stability. 152. Lab data and other essentials needed for assessment of need for bronchial hygiene therapy include? Chest x-ray, PFT results, ABG values or oxygen saturation. 153. What common conditions affect the cough reflex? Muscular dystrophy, Amyotrophic lateral sclerosis, and Cerebral palsy. 154. What common drugs can impair mucocilliary clearance in intubated patients? General anesthetics, Opiates, and Narcotics. 155. What is the recommended airway clearance technique for patients with cystic fibrosis, ciliary dyskinesia, bronchiectasis or infants? PDPV (postural drainage, percussion, vibration). 156. What postural drainage position would be used for a patient an abscess in the right middle lobe? 157. What postural drainage position would be used for a patient with aspiration pneumonia in the superior segments of the left lower lobe? 158. What postural drainage position would be used for a patient with aspiration pneumonia of the anterior upper lobes? 159. When using flutter, patients can control the pressure by? By changing their expiratory flow. 160. What is Chest Physical Therapy? Collection of therapeutic techniques designed to aid clearance of secretions, improve ventilation, and enhance the conditioning of the respiratory muscles; includes positioning techniques, chest percussion and vibration, directed coughing and various breathing and conditioning exercises. 161. How do you know if a patient is having issues with retained secretions? Look at the physical findings such as a loose, ineffective cough, labored breathing pattern, decreased or bronchial breath sounds, coarse inspiratory and expiratory crackles, tachypnea, tachycardia, or fever may indicate a potential problem with retained secretions. A chest radiograph often shows atelectasis and areas of increased density in such cases. 162. What are the indications for postural drainage? Turning, Inability or reluctance of patients to change body positions, Poor oxygenation associated with position, Potential for or presence of atelectasis, Presence of artificial airway, Evidence or suggestion of difficulty with secretion clearance, Difficulty clearing secretions, with expectorated sputum production greater than 25 to 30 ml/day, Evidence of suggestion of retained secretions in the presence of an artificial airway, diagnosis of diseases such as CF or bronchiectasis, Presence of foreign body in airway. 163. What are the indications for the directed cough? Need to aid in the removal of retained secretions from central airways, Presence of atelectasis, Prophylaxis against postoperative pulmonary complications, Routine part of bronchial hygiene in patients CF, bronchiectasis, chronic bronchitis, necrotizing pulmonary infection, spinal cord injury, To obtain sputum specimens for diagnostic testing. 164. What does mucous plugging lead to? Mucous plugging can result in atelectasis and impaired oxygenation secondary to shunting. By restricting airflow, partial obstruction can increase the work of breathing and lead to air trapping, over distention, and ventilation/perfusion (V/Q) imbalances. 165. What is an example of cough stimulation caused by a mechanical stimulation? 166. What is an example of cough stimulation caused by an inflammatory process? 167. What is an example of cough stimulation caused by chemical stimulation? When irritating gases are inhaled, such as cigarette smoke. 168. What is an example of cough stimulation caused by thermal stimulation? 169. What is considered copious production of secretions? 25 to 30 ml/day, which is about 1 ounce or about the size of a shot glass. 170. What is the triple S rule? Whenever you observe an untoward patient response during postural drainage, the respiratory therapist should stop the therapy (return patient to original resting position) and stay with the patient until he/she is stabilized. 171. 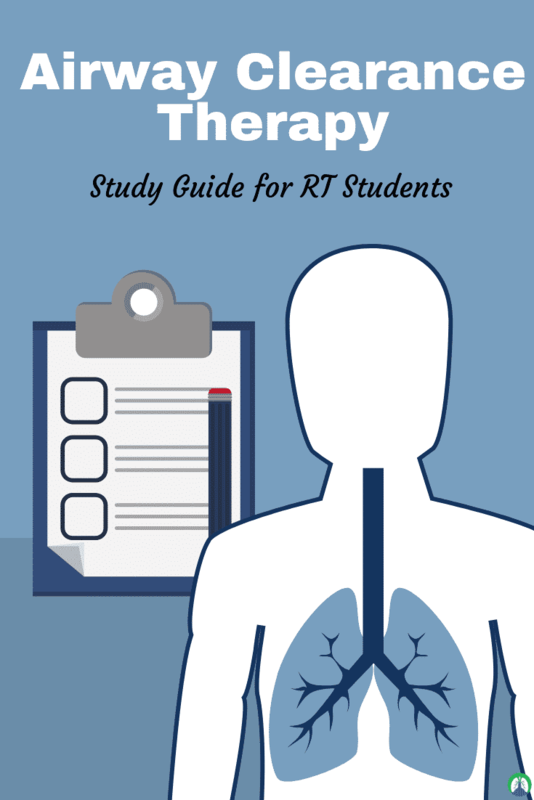 What landmarks should the respiratory therapist avoid during manual percussion? 172. What position should the patient be in while performing the directed cough? The patient should assume the sitting position with one shoulder rotated inward and the head and spine slightly flexed. The patient’s feet should be supported to provide abdominal and thoracic support for the patient. If the patient is unable to sit up, the clinician should raise the head of the bed and ensure that the patient’s knees are slightly flexed with the feet braced on the mattress. 173. When should the postural drainage order be reevaluated? At least every 48 hours for patients in critical care and at least every 3 days for other hospitalized patients and every 3 months for patients receiving home care. 174. Without an effective cough, most airway clearance techniques cannot succeed in what? 175. What are the 3 things needed for normal airway clearance? A patent airway (open airway), functional mucocilliary escalator, and effective cough, because an effective cough can move mucus from the lower airways to the upper airways for removal. 176. What are some diseases associated with abnormal clearance? Asthma, lung cancer, kyphoscoliosis, chronic bronchitis, acute infections, Cystic fibrosis, Bronchiectasis, and neuromuscular diseases. 177. What is the primary goal of bronchial hygiene therapy? To help mobilize and remove retained secretions. The ultimate goal is to improve gas exchange and reduce the work of breathing. 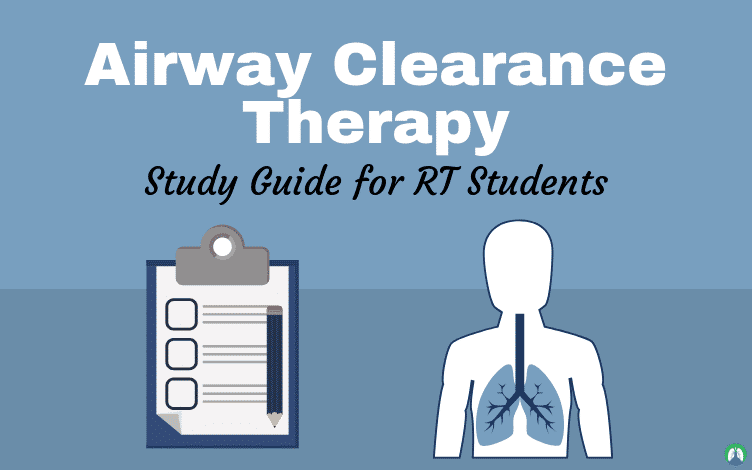 So there you have it — that wraps up our study guide on Airway Clearance Therapy. I hope this information was helpful for you. Many students have used our guide to study and prepare for their exams in RT school. I hope that you can do the same! Thank you so much for reading all the way to the end, and as always, breathe easy my friend. 🔒 And don’t forget, if you need help with the Egan’s Workbook — we looked up the answers for you so that you don’t have to. Check out our Workbook Helper to learn more.